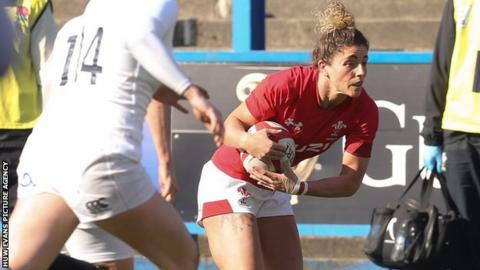 Wales captain Carys Phillips says she is "pleased and proud" with her team's performance despite a 51-12 defeat by England at Cardiff Arms Park. Wales scored tries through wing Jess Kavanagh and prop Cerys Hale, after two scoreless years against England where they were beaten 52-0 and 63-0. However poor defending in the early stages had handed England too much of an advantage. "We let in a cluster of tries, then we stepped up," said Phillips. "There were definitely some dominant parts of the game from us in the scrum and some of the ruck areas. "So overall, very pleased with the girls and very proud of the belief they showed." A neatly-taken 35th-minute try from Kavanagh, cutting back inside three tacklers, was Wales's first of their 2019 Six Nations campaign - and the first against a professional England outfit since 2016. "To score the try is an amazing feeling, then we came out for the second half all guns blazing and kept them scoreless for 20 minutes. That's a little 'win' for us," said Kavanagh. "It's always going to be a hard shift when you go in against a professional side, but we've got to focus on ourselves." "I know the A470 like the back of my hand, but it's what you do for the love of the game," she said. Even if there is no current prospect of Wales contracting a professional squad in the same way as England, coach Rowland Phillips wants to develop more strength in depth in the national women's game. "It's more than just grabbing 30 players and turning them professional; the fact is they have maybe six times more players to choose from playing adult rugby in England," he told BBC Sport Wales. "That's a big thing we're working on, the participation side of our game. "We might not reap the rewards for years to come, but we're seeing people like Lauren Smyth, Gwenn Crabb, Manon Johnes coming through, these are young kids." Wales head to Glasgow on Friday, 8 March two points ahead of Scotland at the foot of the table, thanks to their 3-3 draw in Italy in round two. For the latest Welsh rugby news follow @BBCScrumV on Twitter.